UAD-2 Live Rack är en robust 16-kanalers (MADI) Thunderbolt-3 effektprocessor som gör det möjligt för ljudtekniker att använda UAD plug-ins av studiokvalitet, i realtid, i en livemiljö. Upp till fyra Live Rack kan kombineras vilket ger 64-ljudkanaler via MADI. Live Rack styrs av mjukvara specifikt designad för snabb, enkel och säker drift under live-shower. UAD-2 Live Rack har fyra SHARC-processorer (QUAD). UAD-2 Live Rack Core – Levereras med 12 plug-ins. UAD-2 Live Rack Ultimate – Levereras med över 90 plug-ins. *Priset är inklusive moms. Kolla alltid vår produktdatabas för uppdaterade priser. Realtime UAD Effects Processing, Purpose‑Built for Live Sound. UAD-2 Live Rack is a robust 16-channel MADI effects processor that allows live sound engineers to craft studio-quality mixes using Realtime UAD Processing and industry-leading UAD plug-ins — including Antares Auto-Tune Realtime — right out of the box. Built to withstand the rigors of live sound, users can chain up to four UAD-2 Live Rack units for up to 64 channels of MADI signal processing. 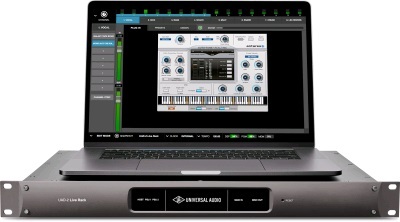 *Live Rack includes the Core or Ultimate UAD plug-in bundles. Other UAD plug-ins sold separately. 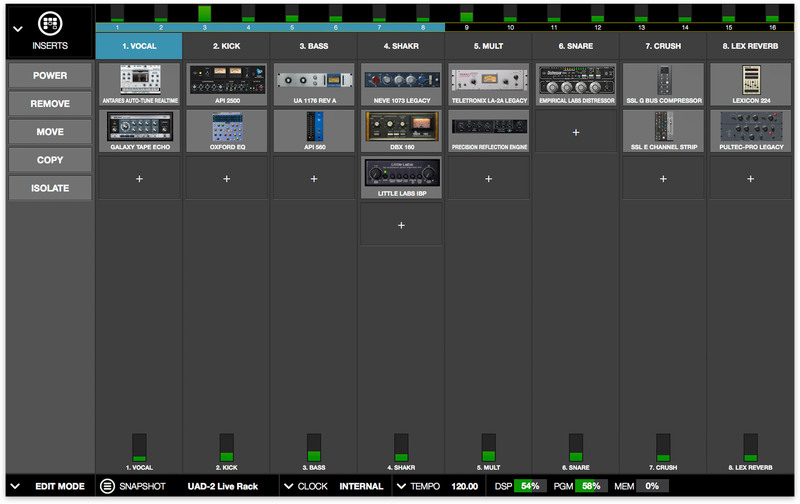 A small number of UAD plug-ins are incompatible with UAD-2 Live Rack. 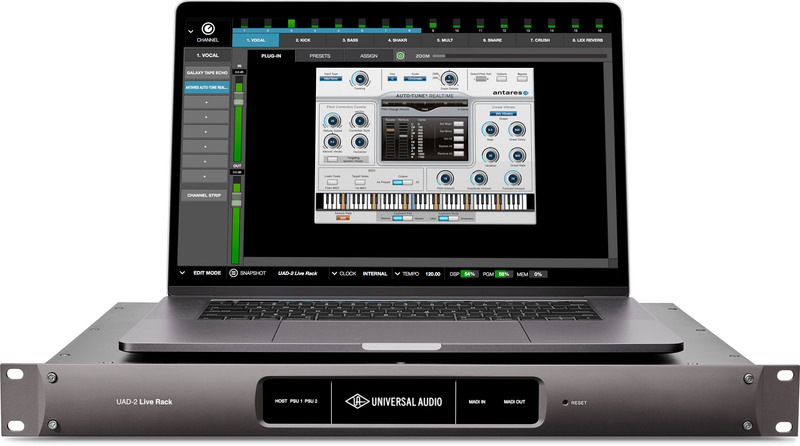 For full details, visit help.uaudio.com. UAD-2 Live Rack Core includes a generous suite of UAD plug-ins right out of the box, featuring Teletronix LA-2A and 1176 compressors, Pultec EQs, and more. UAD-2 Live Rack Ultimate offers 90 UAD plug-ins, with titles from SSL, Studer, Neve, Manley, Lexicon, API, Moog, and more. Both Core and Ultimate bundles include the Antares Auto-Tune Realtime plug-in. Legendary for its vocal enhancing and creative applications, use genuine Antares Auto-Tuning in real time for pitch correction and modern pop vocal effects. 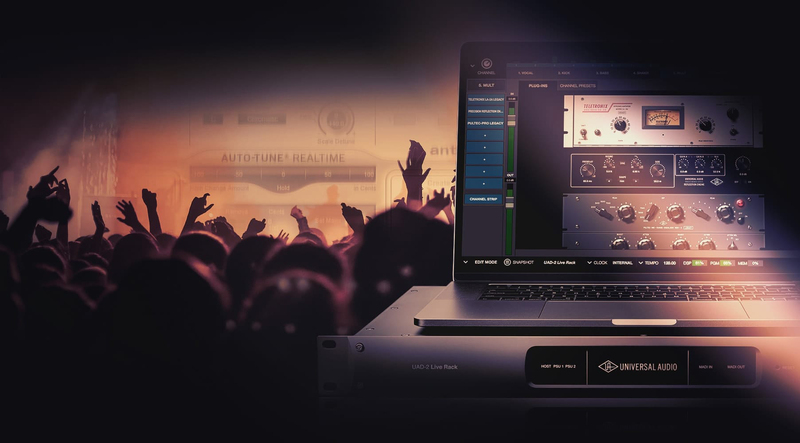 With the Live Rack application, front-of-house engineers can take advantage of intuitive features such as drag and drop, copy and paste, keyboard navigation, plug-in zoom, and the ability to store and recall channel strip presets and/or complete setup configuration Snapshots. Designed for seamless operation in a live setting, the Live Rack app features large text and GUI elements making it easy to quickly tweak parameters. The Live Rack app also features MIDI snapshot recall capabilities as well as networked software integration with select Soundcraft Vi consoles.